This log cabin (timmerkoja) was built around 1920 according to an old building tradition, which put the fireplace in the centre of the hut. Wide berths were placed along the walls. There, men would lie closely together on spruce beds, heads to the wall and feet to the fire. Food was cooked on the open fire of the fireplace. 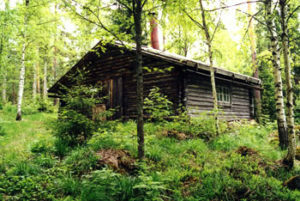 Many loggers would live in cabins like these during the winter, when most of the logging was done in the forests. This log cabin was donated to the homestead museum in 1958.